This friendly, practical guide takes you from evaluating the material to be welded all the way through the step-by-step welding process, and everything in between. Plus, you'll get easy-to-follow guidance on how to apply finishing techniques and advice on how to adhere to safety procedures. 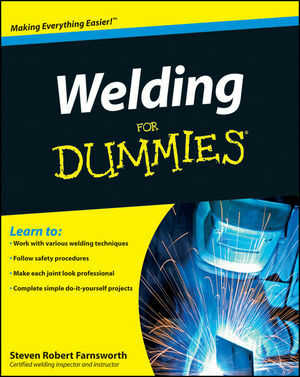 Whether you have no prior experience in welding or are looking for a thorough reference to supplement traditional welding instruction, the easy-to-understand information in Welding For Dummies is the ultimate resource for mastering this intricate skill. Steven Robert Farnsworth is a welding teacher with more than 20 years of experience in teaching all methods of welding. He served in the U.S. Navy, working to keep the fleet afloat with his welding repairs.